5 Tips for Organizing Your Meals and Getting Dinner on the Table – What's for Dinner Moms? This is a great time to also look at all those little goals we have set for ourselves at the beginning of the year. Abandoned them all? Why not pick a little goal and start again? 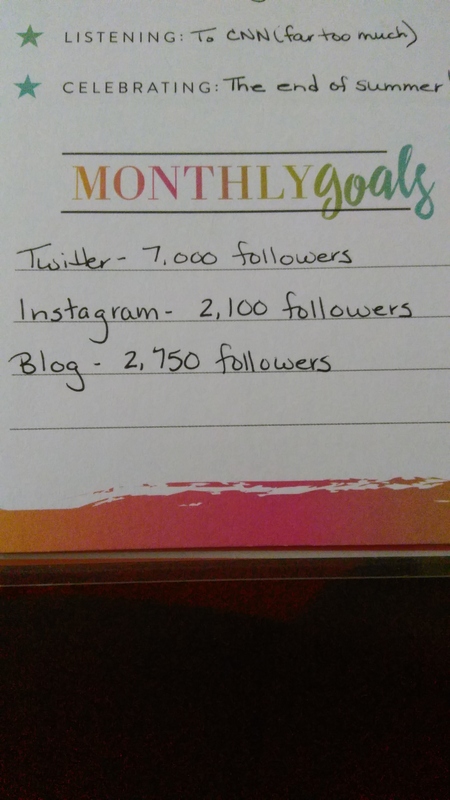 Set your blogging or social media goals? I write my monthly goals so I can see the progress I am making toward my yearly goals right in the corner of my monthly and weekly calendar. That way I can adjust where I am focusing my efforts and not neglecting one area that really needs help or adjust my goals as I need to. What is one goal you want to work on the last four months of the year? It is not too late! In keeping myself organized and meeting my goals for back to school I am pulling out all of my slow cooker recipes and giving them an update or new pictures. I use my slow cooker year round but this time of year it gets an extra workout as we are trying to figure out schedules and when we will all be eating dinner. Some nights we eat dinner all together as a family (which I prefer) but some nights that is just not practical and we eat dinner in shifts (one or two at a time over several hours). Those are the nights that casseroles (which reheat easily) or my slow cooker are handy to have for dinners. Take advantage of the time you have to cook or prep meals and do an extra one or two meals while you are making dinner. This takes some planning. You need to know what you are having for meals the next 2-4 nights. Sit down when you have a free moment (haha) and plan out only 1-3 days of meals to begin with. Don’t make them fancy just chicken, salad, and green beans or tacos with black beans. Just so you know what you need. I use lots of plastic dishes to store our prepared vegetables or cooked meats in so they are easy to pull out and get on the table. Want to eat more salads and vegetables? Take advantage of early morning and mix a salad for dinner. Except for the most delicate items you can mix baby spinach, greens, cucumbers, onions, celery, carrots, etc… in a large bowl and cover it so that if you are eating in shifts everyone can take a bowl of salad to have with their dinner. Prep your hearty vegetables all at once. Trim green beans, cut broccoli, and slice Brussels sprouts and bag them for a night or two later. Have them all portioned out and all you need to do is boil some water to steam them! Look at your calendar ahead of time and know when you are meal planning which nights are busy and will need a quick meal or a slow cooker meal. If you know the night before that you need a slow cooker meal and have a couple of minutes while cleaning up from dinner throw the ingredients for dinner in the bowl of the slow cooker (as long as it is removable) and put the whole bowl covered in your refrigerator. Take it out the next morning and put it in the slow cooker, set it to the temperature you need, and the time. Dinner is cooking! (This is best done on low heat and not on high as it may damage the bowl of the slow cooker.) This works great for marinating meats. Don’t set out to conquer the meal plan all at once. Start small with a day or two at a time. Let it grow slowly as you begin to get down what works for you. There will be bumps along the way but don’t give up! Start again and keep in mind what didn’t work last time. I meal plan for a month at a time when I am on my game but sometimes it is two to four days at a time because life is like that. Find what works best for you. Did some of this today. Thank you for posting. Thanks. Hope it works for you! That’s all very valuable tips. I love how you give tips which vegetables and salad items can be prepared in advance. I am making a list once a week what to cook during the next week and I need to make a plan too when to pre-cook. We are all in the same boat, aren’t we?